Astoria, Oregon - Betty and Ben Jordan of Astoria learned first hand about the quality of construction of the roof design of their Americana model fifthwheel. They were traveling during a winter storm on a two lane causeway near Astoria, Oregon, where the Columbia enters the Pacific Ocean, when they were hit by a number of gusts of wind exceeding 60 miles per hour. Despite the fact that fifthwheels out perform all other types of RVs in cross winds, these ferocious winds forced Ben to the side of the road. fiberglass model, an aluminum skinned model built to Americana specifications with a very stong Americana spec truss system. Our RT spec requires a laminated floor in the bathroom. When this rigid floor is fastened to the solid sidewall a torquebox is completed. This unique design feature is to help prevent the body from twisting while going down the road. The result of the torquebox (we believe we are the only fifthwheel offering this advanced body strength feature) is to insure good slideout room fit for the many years of eexpected tough service. 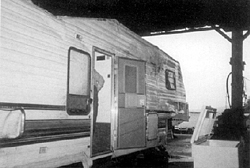 Because the RT spec for construction calls for the walls to be in compression (not hung from the side), the roof and walls to be strapped together with steel straps, and the cabinets to be fastened to the sidewalls and roof with case hardened screws rather than stapled (the cabinets are an integral structural component of an RV), the roof was able to take the force of the roll, sparing the truck and hitch from serious damage (accolades to the hitch installer as it is still being used today), and the passengers (including the dog) from injury. Luckily Ben and Betty were wearing their seatbelts, and they were able to make it through their mishap without a scratch. 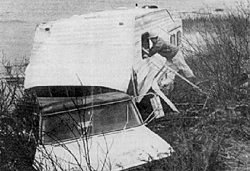 The Jordans would have been quite content to have escaped without damage to themselves, their dog, and their truck, and chalked the loss of their fifthwheel up to experience, except that the fifthwheel's roof held up! It protected the rig well enough that the cabinets still fit and were still in place, and the walls were still straight and solid. Most of the damage was limited to the bedroom roof, which took the brunt of the impact. If you have ever seen a typical RV with a typical roof after it has rolled, then you know it is not a pretty sight. Usually all that is left is a barren chassis and RV pieces strewn about for hundreds of feet, not to mention two very unhappy owners, and possibly a dog that is even more so. good value means more than just a good price. It means having confidence in quality of construction and the safety that quality provides.